Mobile company Honor put on a spectacular event last week at the The Mermaid, London. There was much buzz before the event about whether they were revealing one or two phones. I’d heard on the grapevine that it was two, so I was really excited to hear what they had to share with us! Over the past year, I’ve been watching Honor progress. The mid market phone industry has had me hooked of late. It’s so exciting to see all the companies releasing reasonably priced phones that are pushing the flagships. As someone who relies heavily on her phone for many different reasons, I rarely looked at the mid range before as they just didn’t ‘cut it’. The technology that’s come out in the past year or so has really made me sit up and take stock though. 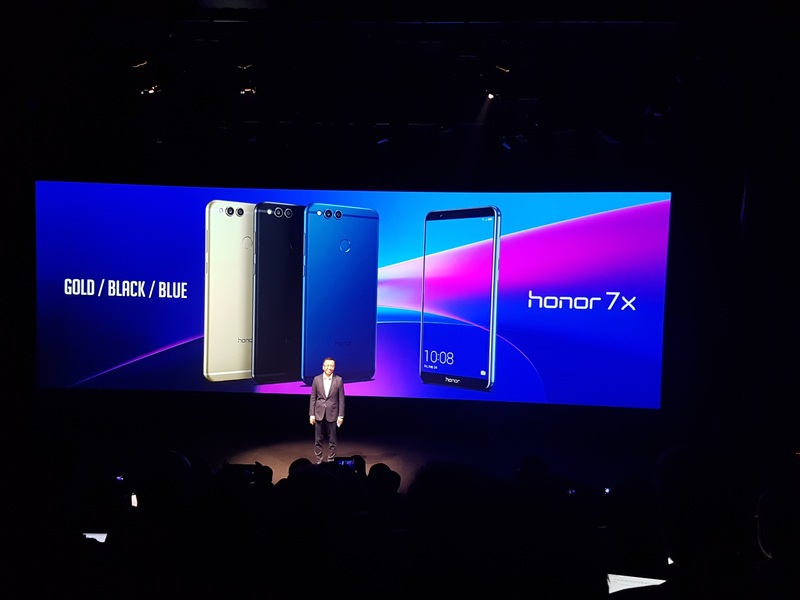 Companies such as Honor, who are owned by Huawei, have really impressed me with their quality, both on the hardware and software side of things. My interest started a few months back when I got an Honor 9. Not only is it a dream to use, it looks slick too! I have the silver Honor 9, however the blue one is possibly one of the most beautiful phone I’ve seen! Back to the event. The main phone we were there to see according to the wristband we were given on entry was quite clearly the Honor 7X, which replaces the 6X. The event was hosted by President of Honor, George Zhao, where he started with some super impressive facts about the company and their rapid growth. He then revealed the new 7X under the title ‘Max your view’. So… Here’s what you need to know! The big selling point of the 7X is the impressive screen to body ratio, 18:9 FullView display. It has 2160 x 1080 FHD+resolution. This screen will appeal hugely to gamers and those that use their phones a lot for multimedia. The wider screen allows you to see more when gaming and will give you that added advantage when playing first person shooters, as was demonstrated. When you look at price point, you’re getting a really good processor for your money. The Honor 7X has 4GB RAM, 2.36GHz Octa-core Kirin 659, and EMUI5.1, making the phone nippy and smooth. The phone boasts a 16MP dual lens and 8mp front facing camera. So you get great depth to your photos and it even has a gender beauty mode when in selfie mode to make your selfies flawless. Impressive, long lasting 3340mAh battery. Need I say anymore on this? Battery is a huge thing for me and I wasn’t sure this would work for me as I am a real power user. I currently have to fully charge my flagship phone 2-3 times a day as I use my mobile as my computer. I can easily go almost a full day with this phone, not having to charge until about 9pm in the evening. Four corner airbag design – This was the funniest part of the demo! George Zhao repeatedly threw the phone over his shoulder, to a room full of gasps! The phone came out unscathed. As a mum to 2 boys, 6 and 13, this technology is very welcome as they are incredibly clumsy and they regularly use my phone for gaming. Although, if I’m being honest, I can be pretty clumsy myself when I’m on the go too. It comes with a fingerprint sensor located ont he back of the phone. The phone comes in 3 colours, Gold, Black and Blue. It’s priced incredibly reasonably for what you’re getting at just £269 in the UK and €299 for Europe. You can see how much effort has gone into producing an attractive but feature full phone for an affordable price. 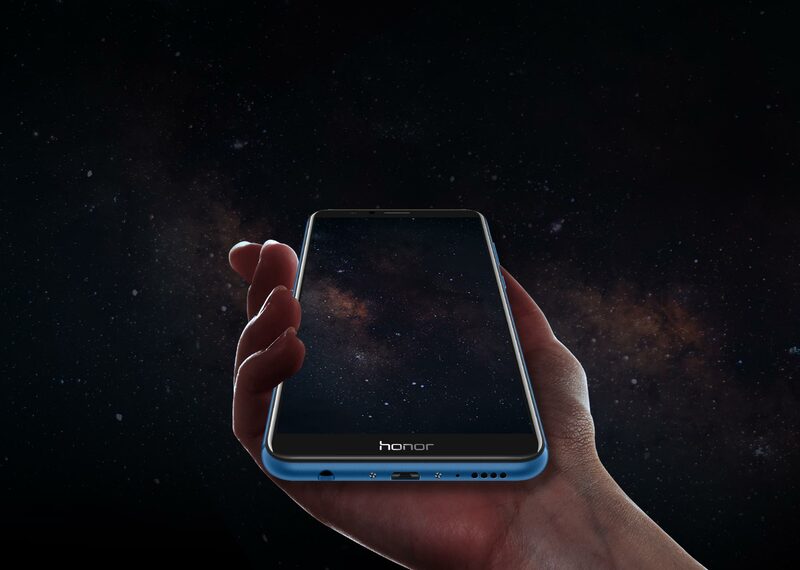 Honor are aiming for the youth of today and with a phone like this, I think they’ll easily win over that market. But this phone is so versatile and boasts such an impressive spec at a price that’s affordable, I think they will reach a far bigger audience provided they push it in the right places. I have used the 7X exclusively for the past week and I can honestly say I haven’t missed my old, flagship phone. The 7X is quick, smooth and it takes great pictures, which is what’s let mid range phones down in the past. The battery life has been very impressive and the screen is great when gaming and watching Netflix. It’s hard to find fault with this phone. It’s attractive, works well and is super reasonably priced! What more do you want?! Zhao also revealed the View 10 at the event, but I I’m hoping to cover this in a separate post. You can expect a hands on review with this phone. Do keep an eye out on my YouTube as I will be showing of my Honor 7X in more detail. Previous Previous post: Fitness with MyZone – Making you work harder!